In the 10 years since the 9/11 attacks, the area surrounding the Flight 93 crash site in Somerset County has been stark and barren. But that’s about to change—thanks in part to some Penn Staters. 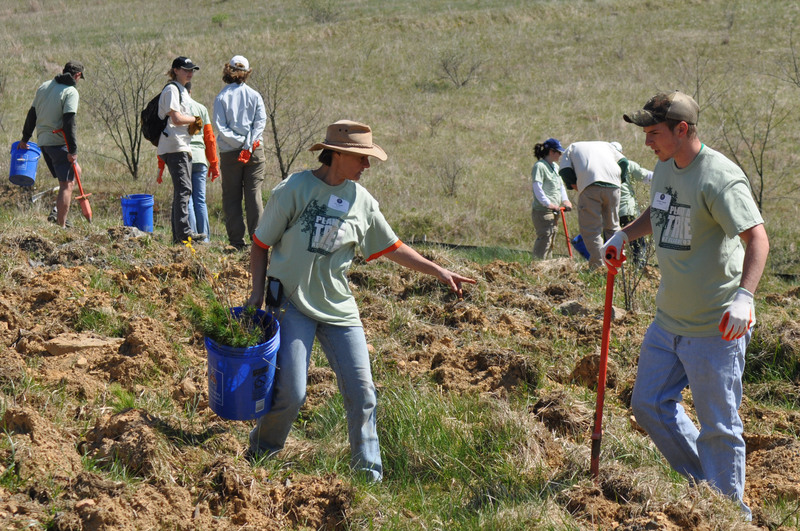 On April 20, about 150 volunteers—including five faculty members and 15 students from the environmental studies and honors programs at Penn State Altoona—planted 3450 trees over five acres. These trees will help lessen the impact of strong winds for visitors at the Flight 93 National Memorial, parts of which are still under construction. Organizers plan to reforest the 120 surrounding acres with more than 150,000 donated saplings over the next six years. The effort also had an educational component: Joe Pizarchik ’79, director of the U.S. Office of Surface Mining, Reclamation, and Enforcement (OSMRE), spoke to the students about the challenges of minewater-drainage–-including the drainage problem Pizarchik helped resolve in 2003 to make way for the Memorial’s construction. Check out this cool video of Pizarchik and the students in action. Entry filed under: Uncategorized. Tags: Flight 93 Memorial, Joe Pizarchik.